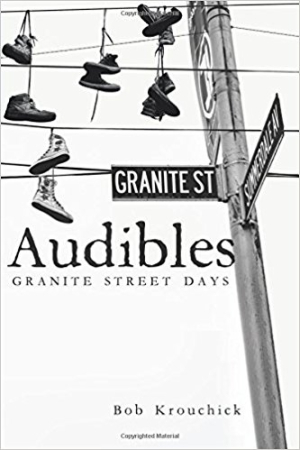 Audibles: Granite Street Days is a warm, substantive, and fascinating story about living life fully and truly. Bob Krouchick’s semiautobiographical novel Audibles: Granite Street Days is all about life’s what-ifs. The story rests on an intriguing premise: middle-aged Bob McShea is given the chance to take time-outs during critical junctures of his life. It’s called “calling an audible”—making an extemporaneous play based on the real-time conditions he’s magically privy to. The story’s start finds Bob living a comfortable, fulfilling life. He was an athlete in high school and college, and he’s been married to his wife, Rita, for twenty-four years. They raised five children. His career was successful. Most nights, he falls asleep watching sports. Though Bob feels he has little to complain about, he still reminiscences about his youth on Granite Street. How might his life have turned out had he made different decisions? He’s intrigued when a mysterious man, Phil, emerges out of a hazy dream to offer him an actual replay, armed with all of the knowledge he currently has. He’ll also be able to revert back to this life if he doesn’t like the results. The opportunity proves irresistible. The novel lays excellent groundwork for its premise, establishing its central character so well that the book at first reads like a memoir. Its early turn into the fantastical is a legitimate surprise. The other characters in Bob’s parallel lives are well sketched, full of personality and fleshed out by strong backstories. The story plays out intriguingly, with well-thought-out ramifications for the choices Bob makes. It often veers into philosophical territory, mulling that people are the sum totals of their experiences and that even the best-informed decisions can have unintended consequences. Writing is engaging and flows well, with a vivid immediacy that paints a clear picture of the proceedings and keeps the pages turning. The story gets a surprising amount of yardage out of its central sports metaphor. Foreshadowing hints at how Bob’s tale will ultimately play out, but the story is so well structured that it sustains dramatic tension nonetheless. In this thoughtful story, Bob faces difficult decisions; he must weigh the destinies of multiple people, including his dear friends, in his choices. The temptations Bob confronts, like going after power and wealth, are sometimes clichéd. The fundamental rules of the alternate timelines that Bob navigates are loosely crafted, and stakes don’t always feel incredibly high. Still, the scenarios are rendered with such vibrant specificity that they work.